With one month to go, we couldn’t be more excited for this year’s 26th National Rebuilding Day! We will be repairing 36 homes in the Brookland Park and Providence Park neighborhoods, as well as, in the Laburnum Gateway in Henrico County. This is our first time doing any rebuilding day projects in Henrico County and we’re thrilled to be able to include a new population with great need in our service area. In addition to repairing homes, we’ll also be working on three community projects, one being the renovation of a greenhouse at the Richmond Community High School. The greenhouse and gardens will be utilized by the students and seniors in the surrounding community. 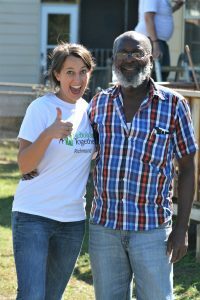 As Rebuilding Together improves and evolves, we are focusing more and more on not just repairing homes, but really revitalizing neighborhoods as a whole. This year we’ll have more resident involvement and more youth participation than ever before. The community is truly embracing the work that we are doing and for this accomplishment we should be proud. This is my first National Rebuilding Day and over the past few months I have been blown away by the overwhelming kindness, generosity and skills that our volunteers bring to our team. Although the big day isn’t until April 28th, this week I have gotten a taste of what to expect in the coming month. In the past couple of days, I have witnessed the Rotary Club of South Richmond assist us with relocating a family of 6 for an entire week so they could demolish half their kitchen floor and two bathrooms. The floors were completely rotted and extremely dangerous, putting the family at great risk. Before the week is up, they will have repaired the kitchen floor, installed new cabinets, and renovated two bathrooms. This project is more extensive than I have ever seen a volunteer complete and beyond what I ever could have expected. I know we will continue to be impressed and humbled by the many projects we will see our volunteer teams complete this month. Cheers to another great National Rebuilding Day and let the madness begin! We can’t wait to see you on April 28th.